Batchelors Way: I received a Blog Award! Wow! My first award! I just do my thing and hope others like it. It's nice to know others do like what you do. 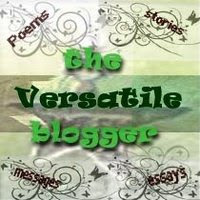 Thanks to Ashley from "No Apologies" for nominating my blog. Thanks Ashley, I love your craftiness. Go over and check her out. 1. I loathe cooking. I only cook because I have to. That cooking and eating thing is always getting in my way. 2.I loveeeeeee CHOCOLATE!!!! Good chocolate! not cheap waxy kinds. 3. My kids think I can fix or make anything!!! 4. I use to drive a 40 foot school bus. Enough said. 5. I love making Halloween costumes. We have a whole closet of them. My kids are spoiled with awesome costume and don't know it. 6. I love organization. I especially like my organization to look pretty as well as function well. 7. I'm happy when I'm serving others. Like doing my job at church or helping out a neighbor or friend. It just makes ya feel good! Pass the award on to 15 bloggers whom you have discovered and think are fantastic. Wow, thanks so much for this award! So nice!! Thank you so much for stopping and for giving me the award! That's so sweet. How fun! Thanks so much Ronda! Awww! Thanks so much for the award!!! Can't wait to check out your blog!